It’s “Shrimp Stir-Fry with Chickpeas and Greens,” and it can be prepped and on the table in less than 30 minutes (take that, you know who!). This dish is a Mediterranean variation on another recipe, Vietnamese-inspired “Plumped Ginger-Caramel Shrimp.” It requires a quick brine, plus ingredients I generally keep on hand. Because it calls for frozen shrimp, it’s one that will go to the head of my weeknight repertoire and encourage me to buy an extra pound and a half of frozen wild shrimp next time I see it on sale. Here’s the recipe for the variation, which feeds four, seen on my dinner table in the photo above. But do treat yourself to the book — which would also make a great gift for your favorite cook, or for someone who’s hoping to learn how to be a better one. Read all the way through the recipe first, before you begin prepping, OK? 1. In a medium stainless or glass bowl, blend the salt, sugar, and chile powder in the warm water. Drop in the shrimp, and let stand at room temperature for 20 minutes while you set up the rest of the meal. 2. Drain the shrimp, peel off their shells if necessary, and pat the shrimp dry. 3. Chop onion, bell peppers, chile peppers and Kalamatas together into 1/4-inch pieces (Nancy’s note: I chopped them separately and mixed them well, after). 4. 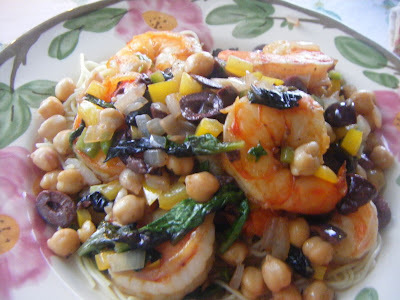 Using 4 tablespoons extra-virgin olive oil, stir-fry the shrimp. When just firm, spoon them from the pan to a large serving bowl. 5. Swirl a little more olive oil into the pan, add the rinsed and drained chickpeas, the chopped onion/pepper/olive mixture, and the salad greens. Stir-fry over high heat for 1 to 2 minutes, seasoning the vegetables to taste with salt and pepper as you cook. Once they are tender-crisp (Nancy’s note: I sauteed the mixture a little longer than the girls called for, and left the salad greens out till the last minute to keep them crisper and bright), add the vegetables to the shrimp and serve. Lynne and Sally suggest tossing this with pasta, and since we had some angel-hair leftover from a previous meal, I reheated it with some olive oil and served the shrimp over the pasta rather than tossing. Standing ovations all around. Anybody else want to suggest some quick-and-easy recipes? Please: have at it. Cook your linguine in salted boiling water until al dente. Meanwhile, get a pan hot and add a couple of good lugs (tablespoons) of olive oil and the pancetta. Fry until golden, then add the garlic and chilies. Soften them slightly and add the clams. Stir, then add the white wine. Put a lid on the pan and cook for a further couple of minutes until all the clams have opened–discard any that remain closed. Remove from the heat and add the drained linguine. Stir in the parsley, correct the seasoning and serve with all the cooking juices. Not many people read a cook book . The key is to READ it, not just preform receips. After reading your previous blog post about the booksigning, I went to the kcls.org web site and put a hold on The Splendid Table cookbook (that’s my new trick to keep me from buying too many cookbooks — check them out first, and only buy those that I might actually use). I loved this book! In fact, it is one of the few that I found myself actually reading. . . and almost every page was a learning experience. Saute diced bacon, the thicker the better. Add diced shallot. Add garlic. Add chopped broccoli. When the broccoli is close to ready, dump in one jar of marinated artichoke hearts and red pepper flakes to taste. Add a diced tomato if you want. Let the liquid reduce a bit, then put it all over angel hair pasta with some parmesan. Serves two, maybe three. If this has taken you longer than 15 minutes, something’s overcooked. When I’m crunched for time or just not in the mood to spend a lot of time cooking fajitas do the trick for me. Fajita seasoning packet or your own spices of garlic, chili powder, cumin, salt, pepper. Slice the meat into bite sized pieces and cook in pan with a little olive oil or low sodium broth. When the meat is about halfway done toss in the sliced veggies. Sprinkle with the seasoning to taste. I usually don’t use a whole fajita packet if going that way. Just about half does the trick. When everything is cooked place in a bowl and put it on the table for everyone to dig into. Sour cream & salsa are for condiments. Have sliced olives and/or avocados to put in the fajitas. For the veggie/vegan crowd in a hurry and on a budget, try either of these two by Lorna Sass: “Short-Cut Vegetarian” and/or “Great Vegetarian Cooking Under Pressure. Nothin’ fancy but easy, quick, nourishing and delicious. There’s not a bad recipe in the bunch. If you have a pressure cooker you can “speed-soak” even garbanzos, and organic canned beans are decently priced @ Trader Joe’s. I have even found some at Grocery Outlet on occasion, along with organic marinara sauces and organic cheese……..
An update: after buying this book and reading your blog entry, I did indeed try this recipe a few nights back. It was easy, taught me a few new techniques (never thought of tossing in salad greens — awesome! ), and worked nicely with a bowl of brown rice on the side. * this was just too salty for me, and there wasn’t enough chili. Next time, I’m doubling the chile powder and cutting the salt in half. * Other than the salt, the recipe was a little too bland. I’ll add more fresh veggies, maybe a few spices and herbs to the mix. * I think this would also work quite well with black beans.